House Cleaning is a Fast Growing Business. Handi Maids has expanded its client base to over 16 Ontario communities so far including: Georgina, Newmarket, Aurora, Richmond Hill, Markham, Vaughan, Orangeville, Alliston, Tottenham, and Barrie. We are always looking to expand and make a difference in other under-serviced parts of Ontario. Handi Maids has developed a system that generates the consistent growth of a new business while maintaining and retaining repeat clients. The Handi Maids systematic formula takes the guess work out of starting your own business. We provide a detailed market strategy and customer care system allowing the Handi Maids franchise owner to quickly develop a significant business which generates repeat business. The most precious commodity in todays society is TIME! 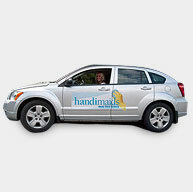 The Handi Maids system affords clients the extra time they need. They have peace of mind knowing that they have hired a trusted service to work for them!